Announcement letters are usually written in order to provide pieces of information or announcements about anything and everything. However, making an announcement needs a specific platform and when you have to give it in writing then it has to be more formal. Whatsoever be the content, the written materials, must definitely have a proper beginning, middle and an end. Likewise, an announcement letter is also expected to have a proper beginning, middle and an end. This avoids the chances of misunderstandings and misconceptions and irrelevant gossips. Writing such letters requires special care as too much information can make them seem dreary but too less can cause serious confusion in the minds of the people the letter is directed towards. When you are asked to write an announcement of a play, you must basically need to know all the details about the play that is going to happen. Each simple and minute details plays a very important role in the announcement letter of a play. So before beginning to write the letter, be sure that you have got ample information about the content of the letter. Also, be sure to convey the information as concisely and precisely as possible. The important thing to always remember while drafting such a letter is to consider it from the point of view of the readers. Make sure to double check the letter to make sure it fits the bill. 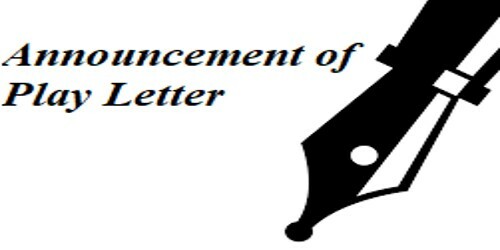 Tips to write an Announcement of a Play Letter – A sample announcement letter is to help you develop a mere idea of how to write the letter. Your announcement of the matter should be quick without making it too lengthy. Since it’s an announcement letter, the readers might come across doubts or clarifications which the sender must anticipate and mention them to avoid the reader ask further questions. If the announcement matter is simple, don’t add heavy words just to fill the page. The letter must be re-checked for further amendments, if necessary. I, (name of the sender) am writing this letter to inform you that there is play happening in (mention the venue) at (time) on (date). (Describe in your own words). The name of the play is (name of the play) written by (name of the author) and is based on the theme of (mention the theme) which comes under the category of (mention which category). (describe all about the function). We, the organizing team are pretty sure that each and every one of you attending the play will be benefited with a really wonderful work of art which you could cherish forever. Try to be there on time and hook your seatbelts because it’s going to be a fantabulous play. (Cordially Describe your requirements). If you do have any doubts or queries regarding the same, please do feel free to contact us in (phone number) or (email).